Whenever I get to thinking about the old New York City, with its cheap book marts and thriving alt-weekly trade, its surplus of less unaffordable apartments, and tolerance (or indifference) to street art that hadn’t been curated or vetted to death—in short, the turnstile-jumping bridge-and-tunnel life that began disappearing long before 9/11—I think about Mark Beyer. At one time, many of these weeklies serialized Beyer’s cerebral, deadpan comics—especially the long-lived Amy & Jordan—before they dried up, along with the paper they were printed on. 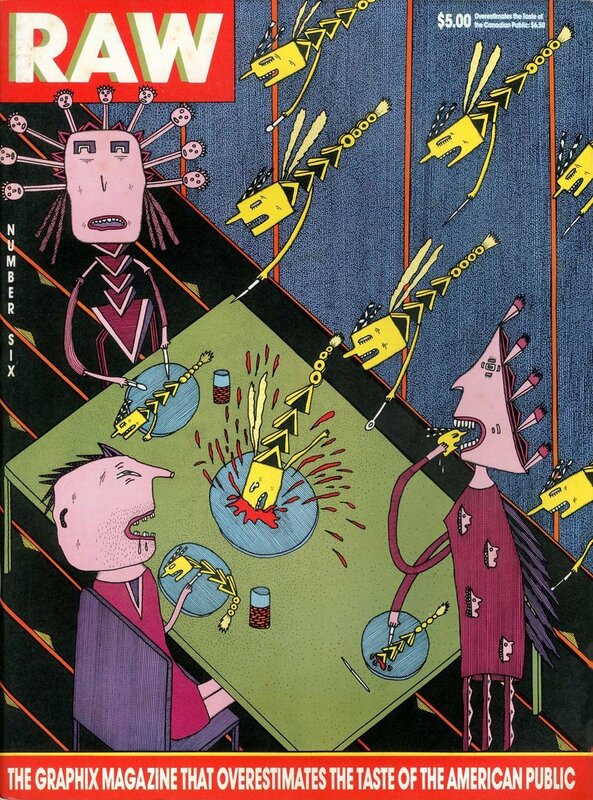 Beyer got started in 1976 when Arcade: The Comics Revue, a short-lived West Coast magazine founded by Art Spiegelman and Bill Griffith, published his first strip; his wider debut came after Arcade folded sometime later that year, in the pages of Spiegelman’s next venture, RAW, in 1980. Designed by Spiegelman and Françoise Mouly to be held and flipped through and beautifully curated, RAW was the ideal venue for Beyer’s work—a weirdo’s weirdo in profoundly weird company. Best known for introducing the world to Spiegelman’s ash-grey epic Maus, the magazine also featured Joost Swarte, Chris Ware, and Gary Panter, alongside the Boody Rogers’ bizarro Babe, Darling of the Hills, and Beyer bits like The Glass Thief (Vol. 2 No. 1: Open Wounds from the Cutting Edge of Commix), and Outside Out (Vol. 2 No. 2: Required Reading for the Post-Literate). 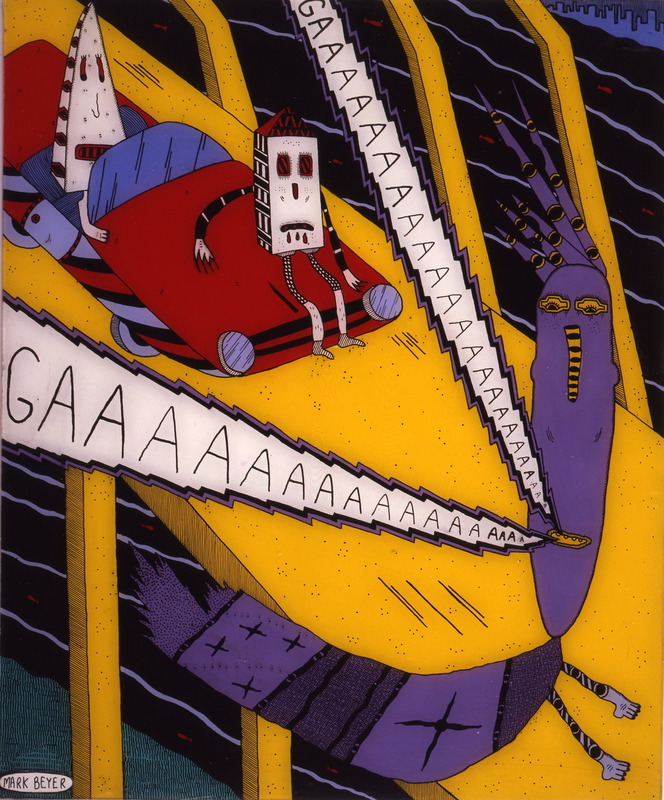 In an interview with Les Coleman for Raw Vision magazine in 2013—perhaps one of two he has ever granted—Beyer claimed that he’d never had his heart set on cartooning, and that if “I had received a rejection letter from Arcade, I would have never made another comic strip.” (Most of his paintings on Plexiglas are Untitled.) Coleman describes Beyer’s characteristic style as “solid areas of black and white, repeated lines, short dashes, dotted stippling with a strong emphasis on pattern. There is no colour, no attempt at chiaroscuro and no illusory depth. Any sense of space is described by the use of flat layers, one behind another in the manner of stage sedentary. 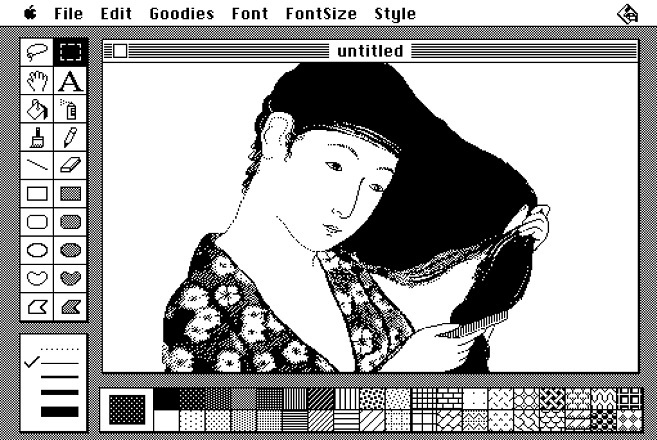 It is reminiscent of the way Robert Wiene used painted theatrical flats in his black and white expressionist film The Cabinet of Dr Caligari (1920).” I would say his stippling reminds me of the preset patterns in the old MacPaint. 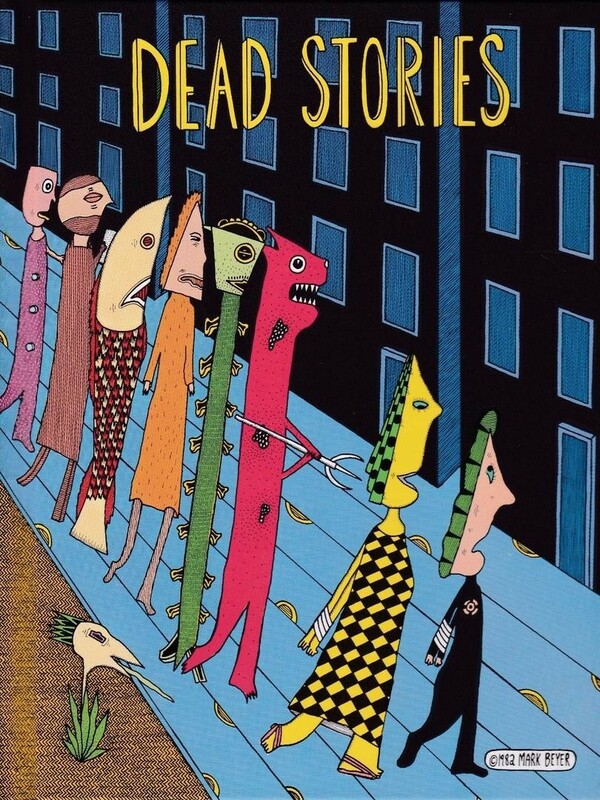 My introduction to Beyer took place in the ‘90s by way of the meticulously self-deprecating caricatures that graced the covers of several novels published by the independent—and, now, sadly defunct—Four Walls Eight Windows press, in what still seemed in those days a truly distant New York. (I later interned there, but that’s another story.) 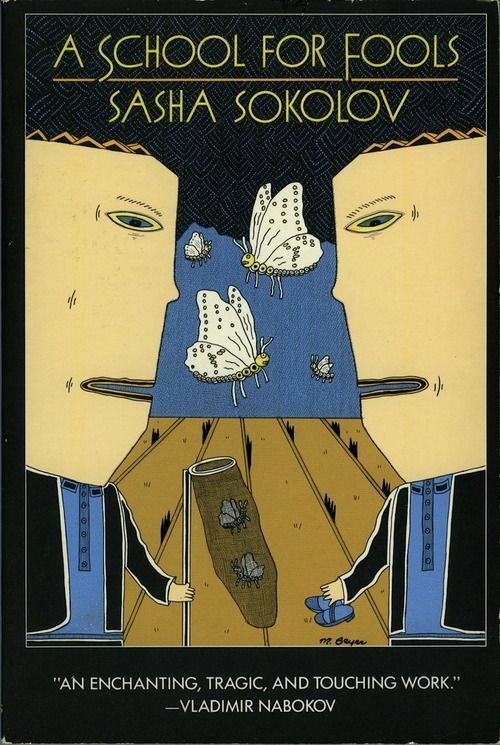 There was Sasha Sokolov’s A School for Fools, a translation from the Russian with its Nabokov blurb (“An enchanting, tragic, and touching work.”) and decidedly un-Nabokovian rendering of two students, their butterfly net, and some very strange-looking butterflies. That book, in turn, led me to a series of novels and a collection of short stories by Michael Brodsky: Xman (1987), X in Paris (1988), *** (1994), and Southernmost and Other Stories (1996), all published by Four Walls. Like The Garden of Early Delights executed on an Etch A Sketch, Beyer’s geometric illustrations seemed to share a tortured, winking quality with Brodsky’s picaresque novels. Though the violence is always cartoonish or abstracted (Beyer has also created a line of soft dolls), there is hardly a panel or detail in which someone—or something—is not acutely suffering. Still, something about the way Beyer poses figures in profile and his nerdy, endearing style made out of that strange landscape an oddly intimate and relatable hell. Having been raised on the Great Works and Morocco-bound Classics by well-meaning parents, I was totally unprepared for something so untutored to be so effective—as well as for the realization that art could be made out of the minor materials of one’s own awkwardness by, more or less, turning one’s socks inside out to expose the raveled stitching. Beyer reminds me of the late artist Keith Haring. 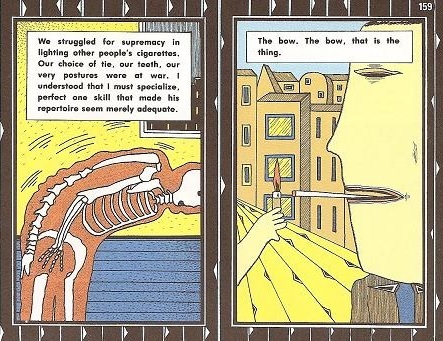 Like Haring, Beyer created a strikingly accented visual vocabulary of his own—immediately recognizable but nonetheless hard to describe—a world parallel to ours, populated by fucked-up and distinctly abstracted figures whose humanity is, somehow, more readily apparent: humanoids with faces like electrical outlets or fried eggs, accordion necks, and telescoping torsos. Beyer’s homunculi sweat visible bullets and cry physical tears; Haring’s inventions come swaddled in editorial markup variously described as “vibrant lines” or “lines of energy” or “emanations” meant to telegraph movement and emotion and pure funk—from the bark of his “Barking Dog” and the radiance of his “Radiant Baby” to the stink coming off a pile of poop that reassures us that it is, in fact, fresh. Though I had come to his work late—A Disturbing Evening was self-published in 1978 and Dead Stories in 1982—what stood out, beyond the existential nightmare logic, was the way in which Beyer managed to capture all sorts of vague and interstitial states from anomie and boredom to horror and dread, with infinite shades of agony and irony in between. What I treasured most in his drawings were the contradictions, the enigmatic open-endedness, the never-ending mystery of the mundane; that Beyer resists resolution and the temptation to wrap things up neatly remains a perverse source of pleasure. 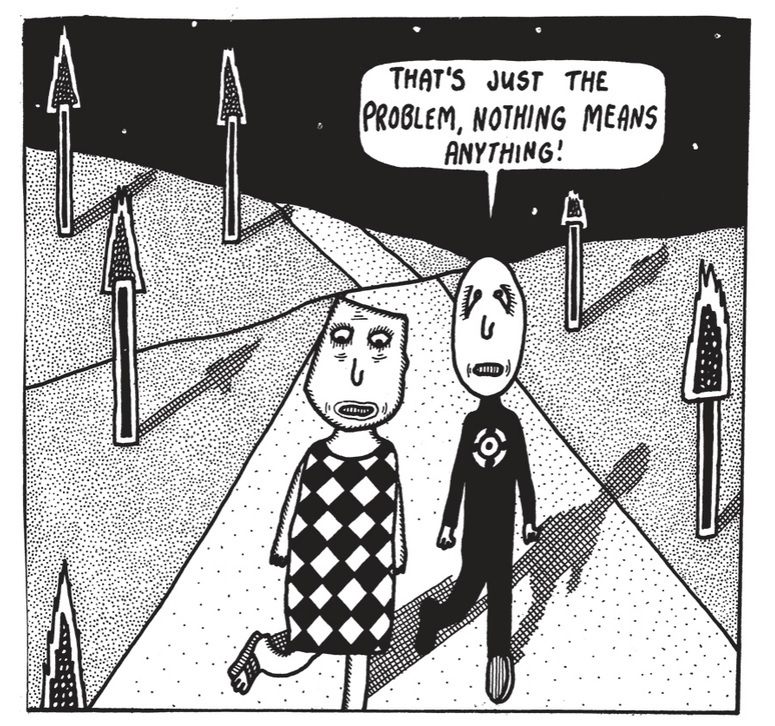 A representative square panel of Agony (1987) depicts Beyer’s stock depressed couple, Amy and Jordan, as a stippled little pair on the road to nowhere, shaded by trees that look more like flaming pencils dwarfed by a cold, starry sky, as Jordan proclaims: “THAT’S JUST THE PROBLEM, NOTHING MEANS ANYTHING!” Another has the two surrounded by “local peasants” at the top of a hill, where the only text is Amy’s: “WHAT DOES MONEY MEAN, THOUGH? NOTHING! WE KNOW IT ONLY TOO WELL.” In his introduction to the reissue of Agony in 2016, Colson Whitehead compares this landscape to Samuel Beckett’s “absurd wastelands,” noting that, like the author of 1953’s Waiting for Godot, Beyer’s brand of despair is braided with both gallows humor and the inability to look away. Amy and Jordan are modern cognates of the tragicomic pairs in Beckett’s play: more Vladimir/Estragon (“ESTRAGON: I can’t go on like this. VLADIMIR: That’s what you think.”) than Pozzo/Lucky. Agony, in particular, looks like something Beckett might have created if he’d been born in Bethlehem, PA, and had his comics serialized in the old New York Press. 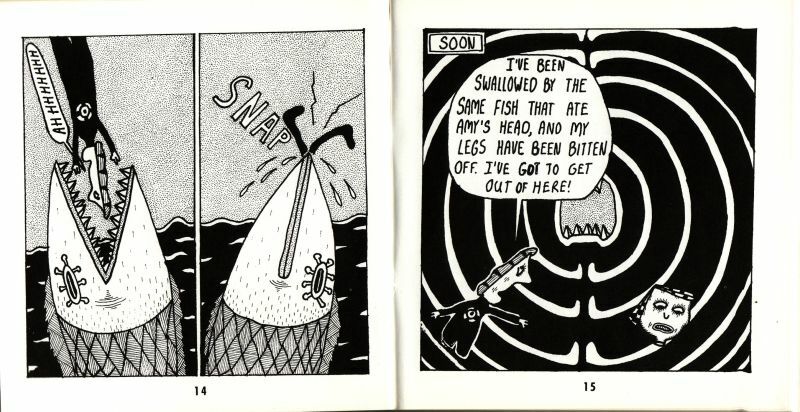 (Beyer was born in Bethlehem in 1950; Haring was born about an hour away in Reading, in 1958.) Perhaps Alasdair Gray is a better comparison: this short book is very much a product of the ‘80s, concise as it is abstract, and rendered in Beyer’s cloister-phobic, crudely flattened perspective. Amy and Jordan are back again, looking like they’ve been assembled out of common rubbish, but it’s not so much what happens to them that’s interesting—it’s their useless awareness of the ridiculous terrors still lying in wait, the suspicion that they are playthings in a grander scheme. Living in perpetual fear, constantly reacting to some new stimuli, they have little memory beyond the current atrocity. Windows and doors are erased, exits disappear. While Beyer’s innovative panel design has been noted, less remarked-upon is the way he wields vanishing point as a kind of visual non sequitur to menace the pair, pursuing his characters from page to page. Nothing goes as planned. The usual logic does not apply. Amy and Jordan struggle to keep down jobs and liquids. They’re fired from another sinister conglomerate, the Pondox Corporation, “due to gross incompetence,” flee from “some hideous ghoul creature,” shed their skin, bicker, commiserate, escape the City, return to the City, regrow their skin, go to the movies, wonder, and cry. There’s no reason for the prolific detail, the elaborate background crosshatching and stippling involved in even the most perfunctory frames on the wall, while the protagonists in the foreground remain virtually protozoan; no reason that, after ripping off Amy’s head, the ghoul should take it to the Aquarium and dump it in a fish tank, where it’s eaten by fish. This minor masterpiece features suffering and bizarre tortures and dashed hopes, but also skyscrapers and rent checks and the odd tender moment. Like I said, it’s a deeply relatable hell. 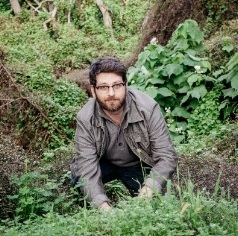 Daniel Elkind is is a writer and translator living in San Francisco.